I got this kit for my Girl Scout troop but can’t find instructions. Can anyone help? Oh, now I have to try to make this… Where do the motors go? Are there cookies? Is there a part number on the box? Is there motors or just rubber bands to move it? I’d call Vex support, they should be able to help. Please post back here what you find out. @GirlScoutJenny - Sent you a message. @Foster - This is a build that VEX created specifically for the RECF and their partnership with the Girl Scouts. There are no motors, just rubber band powered. Any way we could have those build instructions? My elementary girls would enjoy. 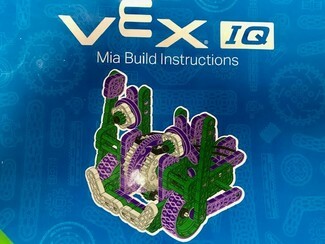 Thanks for the suggestion, we will be posting the Mia build instructions @ https://www.vexrobotics.com/vexiq/resources/robot-builds. They should be posted sometime next week. I got my Mia today. Pretty cool colors, big bag of purple, green and white parts. Took me about 45 mins to make. Lots of attention to detail pieces, But at the end of the build it’s pretty cool. Rubber band powered with arms that wave in the air! Mine went about 10 feet on carpet. There are some parts left over (a hallmark of Vex kits everywhere) so you can do some small frankenmashing. They supply a spare rubber band in case one of the two bands break. This is a Girl Scout build or extra adult help for the Brownies. I’m impressed, and will use mine to reach out to the Delmarva Girlscouts to see if we can get these into the hands of scouts. Nice job VEXIQ engineers, and kudos to RECF for getting these made. Thanks!! Are these available? (I was a cub scout - awhile ago…) I would happily demo it to the local Scout programs. Only have a VEX IQ Starter or Super Kit? You're in luck - these fun robots are built using the 850+ parts found in any of the VEX IQ Starter or Super Kits!